The application form for this reality show is available at Yellow Durbar, Lalitpur. An international franchise beauty pageant Miss Super Model International Nepal: 2019 calls for application of Nepalese contestants. The joint organizer for the event Fashion Guru and global citizen entertainment foundation have organized a press meet on 17th March in Kathmandu. Yogi Aryan, Founder & chairman and Ratnesh Pandey, project Head & Business Development Director of Fashion Guru and Founder & Rajan Shrestha, chairman of global citizen entertainment foundation briefed the press. The top 3 finalists of Miss Super Model International Nepal will get chance to compete in Miss Super Model finale in Delhi, India and the top two contestants of the finale will get chance to debut in Bollywood and global fashion tour. 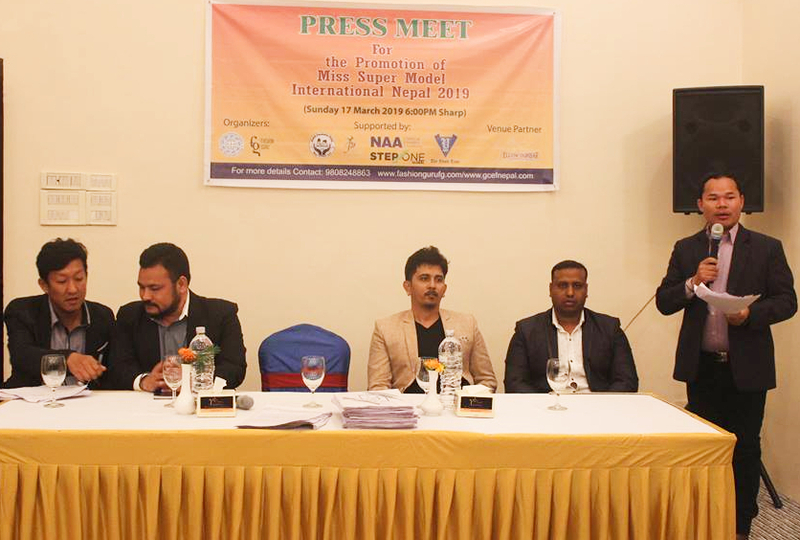 Renowned Celebrities and Best Models of Indian Fashion Industry will be coming later in Nepal for the promotion of Super Model International Nepal 2019 and this will strengthen the decade long friendship of India and Nepal. So, we are expecting everyone’s support for the grand success of this historic event, chairman of global citizen entertainment foundation Rajan Shrestha said. Miss Super Model International Nepal is not a traditional show but is conceived & designed to promote fashion linked trade activity in Kathmandu in promoting the Nepal tourism year 2020 and the 50 percent of profit generated from this event will be donated to Procia Foundation, a non-profit organizations works for children, Shrestha added. Miss Super Model is a beauty contest show for aspiring finale models all over India and the world. The auditions for this show is conducted in different states of India. The top 3 models from each state of India and top 3 contest from 20 different countries will compete in the grand finale in Delhi, Yogi Aryan, Founder & chairman of Fashion Guru said. The participant must be least 18 years old and not above 28 years old. The contestant must be a single woman and fluent in English or Hindi language. The application form for this reality show is available at Yellow Durbar, Lalitpur.